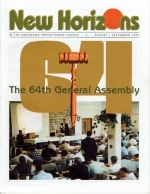 The Presbyterian Church in America held its Twenty-fifth General Assembly in Colorado Springs, Colorado, June 9-13, 1997. Meeting in the sprawling facilities of Village Seven Presbyterian Church, more than 750 teaching elders and 350 ruling elders gathered to do the work of the church and to worship and fellowship together. Most of the commissioners brought their wives, and an ambitious women's program was also part of the annual event. More than half of the teaching and ruling elders in attendance gathered early on Monday (by the appointment of their presbyteries) to serve on committees of commissioners to review the work of the church's permanent committees and its administrative and judicial business. At Tuesday night's opening worship service, the 2,000-seat sanctuary was filled to overflowing, and seats were sometimes hard to come by in daily sessions of the assembly.